Do you spend a length of time during the day in a seated position? Does your body naturally want to go into a slouched position? Many of us have restrictions in the front of our trunk that are causing the soft tissue to shorten (i.e., compress). When this happens we have a tendency to slouch and it is difficult to maintain a more upright posture. With this position the head tends to come forward causing the upper back muscles to work harder to try and support the weight of the head. Many clients complain of headaches, upper back/neck tension, and chest tightness. 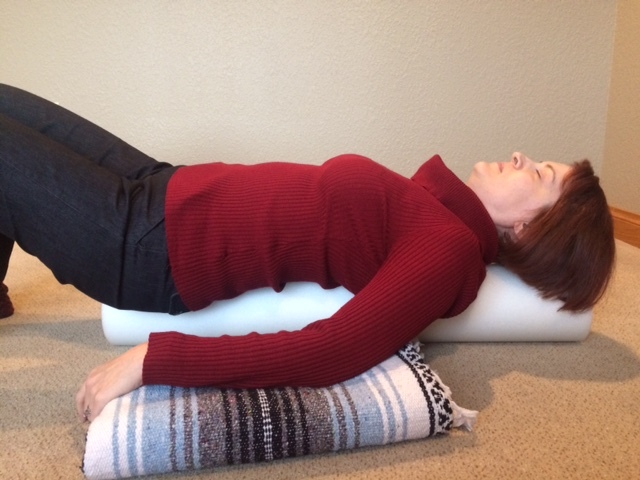 One of the myofascial self-treatment techniques that we recommend for our clients is using the foam roller to open up their chests. Learning how to correctly open up and lengthen the chest is beneficial for most individuals. It is very important that you have your therapist guide you on whether this technique is beneficial for you and take you through the correct way to utilize this technique. Click here for a step by step guide on how to create length and open up your chest. * Move slowly through the steps and making sure to STOP when you feel a slight change or stretch. This is where your restriction is. Take a moment to breathe into the stretch and wait until you feel the intensity of the stretch lighten, that is when the body released the restriction. Now you can again move slowly until you feel the next restriction and continue to repeat the same process. * When finished, gently roll off the side of the foam roller. We all need length and opening in our chests, but make sure to check in with your therapist to make sure that the correct technique is being used. Happy chest opening!